Fourth Row Center: Film Writings by Jason Bailey: On TV: "Catching Hell"
No single entity is producing more great documentaries these days than ESPN Films (here’s where I throw in the required mention of their 30 for 30 series), and no filmmaker is directing more great documentaries than Alex Gibney (whose recent output includes Casino Jack and the United States of Money, Client-9, and a segment of Freakonomics), so it should come as no surprise that their collaboration, Catching Hell, is so unabashedly terrific—a potent stew of everything that is great about both parties. Like the best films in the 30 for 30 series (which it was originally slated to be part of), Catching Hell uses a specific incident to tell a much broader and more penetrating story about not only sports, but human nature. The primary subject is Steve Bartman, the Chicago Cubs fan who became an object of the city’s derision when he reached for a foul ball in game six of the 2003 National League championship. The trouble was that that outfielder Moisés Alou was jumping up to catch that ball, and if he’d have done so, that would have made two outs in the eighth inning, with the Cubs up 3-0 in the game; had they held that lead for the next four outs, they’d have won the best-of-seven series. Instead, the Florida Marlins made a spectacular comeback, scoring an astonishing eight runs in that inning, winning that game and then game seven, and heading off to the World Series. 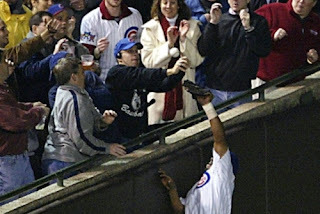 Was all of that Steve Bartman’s fault? Of course not. But baseball fans are a superstitious bunch, constantly fretting over curses and fate and rotten luck; the “Bartman incident” was seen as the turning point when the wheels fell of the Cubbies’ wagon. And that leads us to the real subject of Catching Hell: the psychology of fandom. Why do we get so invested in these teams, in these games? Why do they mean so much? And when those teams fail, what determines where we place the blame? Gibney is, in much of his work, a visceral documentarian (usually something of a contradiction in terms) and in the film’s virtuoso middle section, he puts us right into the middle of that game—the mood, the excitement, the expectation of the early innings, followed by that fated eight inning. He pulls up the dramatic music and walks us through what happened, minute by minute, second by second, play by play. He takes that moment apart: there’s testimony from fans nearby (in a clever touch, Gibney carefully supplies graphics to show where the witnesses were in relation to Bartman), commentary from sportscasters, archival footage (countless angles from the game cameras, plus home video from fans), replays upon replays. He isolates people in the images, desaturates the rest of the image to show us Bartman or an angry fan, erases everyone but Alou to determine if he really would have caught it. He plays the audio that Bartman (who was listening to the radio coverage on his Walkman) would have heard, in sync with the footage, to see if Barman knew that Alou was going for the ball—and then, when informed of the seven-second radio delay, he plays it again with the delay recreated. And so on. Much of this is just fun, a documentarian doing sports forensics. But he also conveys the intensity of what happened in the stands, as the furious fans threw things and yelled death threats—it’s unnerving, as this crowd gets ugly, watching the formation of a mob mentality. “Some fans turned to a real dark place,” we’re told, and based on that home video footage, that’s an understatement. Many people are interviewed—fans, players, sportscasters, sportswriters—though one is conspicuous in his absence: Bartman. After he was smuggled from the stadium in disguise, after he spent days in hiding, after he issued an apologetic statement, he just disappeared—becoming, in one interviewee’s words, “the J.D. Salinger of Cubs fans.” The strange thing is, the film isn’t hurt by Bartman’s lack of participation; first of all, the film isn’t really about him, and secondly, his reclusiveness is part of the story. What was he thinking, as he sat there stone-faced, beer and expletives being pelted on him? What does he think about that night now? We don’t know. We probably never will. The man he does manage to talk to, for the sake of narrative circularity, is Bill Buckner, the Boston Red Sox first baseman whose error in game six of the 1986 World Series provides a concurrent narrative for the film (and an entry point for Gibney, a Red Sox fan). Some have criticized the inclusion of the Buckner material, protesting that he’s not what the movie is about, but that’s an awfully literal reading—it’s about scapegoating, and there’s a long, rich history of that in sports, well beyond Bartman and even Buckner. Gibney doesn’t just present data points and talking heads; as is his wont, he’s asking questions. Shortly after Bartman’s reach, shortstop Alex Gonzalez lets a double-play ball go between his legs; had he not misfielded the ball, the Cubs would have ended the inning and maintained their lead. Freezing on Gonzalez’s fumble, Gibney asks, in his narration: “Does anyone even remember this image?” And they don’t. That’s the trouble with the simplicity of sports narratives—it’s never just one moment, but an accumulation of moments. That’s how it works. But not to the fans in the stands, riled up in the heat of the moment. To them, Boston Globe sportswriter Bob Ryan notes, it is simpler, and more personal: “That guy let me down. Not the city, not the franchise, me.” Catching Hell gets that feeling, and then burrows deeper. "Catching Hell" premieres tonight on ESPN.